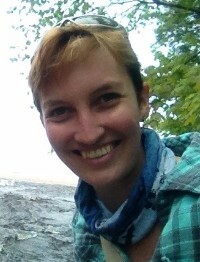 Klara Scharnagl is a PhD candidate in the Plant Biology Department at Michigan State University. She grew up in Miami, Florida. She received her Bachelor’s degree from the University of Chicago in 2010, and her Master’s degree from Florida International University in 2013. Klara’s master’s thesis is titled “The effects of arbuscular mycorrhizal fungi on four legume hosts in south Florida pine rockland soils.” Her current research is studying the role of symbiosis as a biotic interaction in driving patterns of biodiversity along a latitudinal gradient, using lichens as my study system. She is comparing a field sampling approach to an herbarium record approach using the Consortium of North American Lichen Herbaria (CNALH) and GBIF online databases to determine gradients of fungal diversity. She has visited 8-10 lowland forest sites in the Americas, and sampled epiphytic lichen diversity on 100 trees at each site. Further, she will select a sub-group of lichens from the field samples to sequence both the fungal and algal partners in order to determine (a) cryptic species diversity, (b) specificity of the fungal-algal association along a latitudinal gradient, and (c) to reconstruct phylogenies to search for latitudinal signatures in diversification events. Ever since I was six years old, on a family camping in North Carolina Smoky Mountains, I have been fascinated by fungi. But it took a lichen internship at the Field Museum in Chicago during my undergrad to decide that I would pursue mycology as a career. Anne Pringle is my role model because she is not afraid to ask and investigate the interesting questions. Her lab has done research across a broad array of fungi and have taken approaches from citizen science to physics. What is your favorite mushroom, and what do you like about it? Chlorociboria aeruginascens, because it reminds me of family camping trips in North Carolina, and because it makes that beautiful green-blue stain on the wood it grows on. What is your favorite lichen, and what do you like about it? I have many favorites. But one that I like is the fruticose soil lichen, Stereocaulon. It looks like a miniature white shrub on the ground, and many of them have the unique biology of containing both green algal and cyanobacterial symbionts. It is also intriguing to me because it has a lot of cryptic diversity and is in major need of revision. Future project, perhaps? What is your favorite thing/fact about lichens? Again, there are so many fascinating things about lichens. The symbiosis itself is one thing I hope to delve deeper into in my research. But one thing I think is really cool is the ability of lichens to live practically everywhere, from the tideline to the tops of mountains, from deserts to lush rainforests, from grasslands in the Western US to interior Antarctica. Interestingly, one of the few places lichens Cannot live is a really polluted city. Talk about great bioindicators! I cannot tell you how many times I have picked up or even collected poop in the field, thinking that it might be some interesting type of fungus or lichen. Studying lichens means a fair bit of time standing still staring at a tree. This can give you blinders to the world around you, until your focus shifts a bit, and you realize that, in addition to the lichens, you are staring right at a lizard, a large spider, or even a tree viper! Luckily they were just as stunned by the lichenologist as the lichenologist was by them. I love talking about lichens, running workshops on lichens, and making “Lichen Buddies” for kids. In addition to this, I love hiking, running, kayaking, baking and writing poetry. When I have the time, of course! Jillian Myers is a PhD candidate in the Department of Ecology and Evolutionary Biology at the University of Michigan. She received her Bachelor’s degree, with an Honors Thesis, Synergistic inhibition of the lethal fungal pathogen Batrachochytrium dendrobatidis: The combined effects of symbiotic bacterial metabolites and antimicrobial peptides of the frog Rana muscosa, from James Madison University in 2011. Currently her research interests are ‘all things mycoviral’. As a NSF Graduate Research Fellow studying in the lab of Timothy James, Jill is digging into some basic questions: How common are mycoviruses throughout the fungal kingdom (with particular focus on Chytridiomycota, Blastocladiomycota, and Zygomycota. These groups have been almost entirely disregarded in the mycoviral literature.)? What are the origins of mycoviruses? How do mycoviruses alter the phenotypes of their host fungi? I’m still working on “becoming a mycologist”. However, I started studying fungi when a professor at my undergraduate institution reached out to me, asking if I’d like to work in his lab. At the time I was not yet a matriculated student, and still not totally convinced I wanted to get a Bachelor’s degree. ‘d recently finished an Associates and was “dipping my toe” into higher education by taking one course at a University. I didn’t know undergrads could even do research, but when Professor Reid Harris presented the opportunity to study the frog-killing chytrid, Batrachochytrium dendrobatidis, I knew I wanted in. By reaching out to me, Dr. Harris changed my life, starting me along a trajectory I hadn’t known existed! I think about this a lot. That being said, it wasn’t until joining Tim James’ lab that the big, beautiful world of mycology opened up and I realized I don’t just want to be a scientist or a researcher, but a mycologist! At UMich, we’re surrounded by the legacy of Alexander Smith, and I’m completely amazed by his prolific contributions. I also love hearing stories about his commitment to public engagement- he’s an even bigger man in my mind because of that. I’m really into Chlorociboria right now. I can’t get enough of that color! What is your favorite characteristic of fungi? I love that fungi seem to break all the rules. That’s another reason I love fungal viruses, too. Viruses are “supposed” to cause disease, they’re “supposed” to kill their hosts- but not in fungi! Not only does this rule-breaking appeal to my inner teenager, but I think it’s impetus for real scientific progress. Do you have any interesting stories about field work? I did field work in the Sierra Nevada range this past summer. At the San Francisco Airport, I was chatting with the agent who was helping me get my rental car to take with me into the field. I told him I was going to the mountains to do some science and backpacking. He stopped typing, turned to look me in the eyes, and said quietly, “Backpacking changed my life.” He told me his life tale of heading down a bad path as a teenager before he was sent away to a wilderness school, which set him right. “And look at me now!” he said, proudly. As he finished my paperwork, he complimented my very long dreadlocks, told me he was going to give me an upgrade, and said, “I’ve got just the thing for you.” The brand-new Volkswagen Beetle (turbo!) he hooked me up with was far from the ideal field vehicle for mountain terrain, but bonding with a stranger over his transformative experience in nature was priceless! I spend most of my free time with my hound dog, Mouse. We do a lot of canoeing together when the Michigan winter isn’t happening. I also enjoy getting crafty with paper or fabric, and enjoying fermented beverages with pals. Thank you to everyone for their submissions!